Dallas Stars General Manager Joe Nieuwendyk announced late Tuesday evening that the hockey club has acquired goaltender Kari Lehtonen from the Atlanta Thrashers in exchange for defenseman Ivan Vishnevskiy and Dallas’ fourth round pick in the 2010 NHL Entry Draft. A native of Helsinki, Finland, Lehtonen has not played yet this season due to off-season back surgery. He recently underwent a four-game conditioning assignment with the Chicago Wolves and has been activated to play. Lehtonen has an impressive record in shootout contests, having gone 20-8 in those games over his career (the 20 wins are tied for the fifth-most all-time despite not playing at all yet this season). He has also stopped seven-of-eight penalty shots in his career. Finishing last season with a 7-2-0 record in his last nine starts with two shutouts, Lehtonen is Atlanta’s all-time leader among goaltenders in games (204), wins (94), shutouts (14), and save percentage (.912). He has represented Finland in international competition 11 times, including winning a Silver Medal at the 2007 World Championships. Vishnevskiy, 21, has spent most of this season with the Texas Stars (AHL), playing in 51 games (8 goals, 16 assists) with 18 penalty minutes. He also appeared in two NHL games with Dallas, going scoreless. Vishnevskiy was Dallas’ first round selection (27th overall) in the 2006 NHL Entry Draft. He has played in five career NHL games, earning two assists. Career save percentage of 91.2% - 16th best among active goalies. 20-8 career record in shootouts – T-5th most wins ever in shootouts. 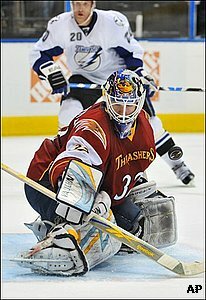 Backstopped Atlanta to 2007 division title, going 34-24-9 with 4 shutouts, a 2.79 GAA and .912 save percentage. Ranked 11th in the NHL in wins and shutouts. Allowed two-or-fewer goals in 29 games. Two-time winner of the top goaltender award in the Finnish Elite League (2002, 2003). Earned a 13-5-3 record, leading team to 2002 Finnish Elite League Championship as league’s youngest goaltender (18).